We are manufacturing low-tension switchgear panels in the brand name of "Devishree” at our works located at Coimbatore. We do manufacture all types of switchgear panels such as LT ACB, LTMV, APFC, PMCC, MCC, SDB, DB, LDB, PDB, Control & Relay, Alarm & Annunciation panels, Control Desk and Bus ducts. Our boards are built with high quality CRCA sheets from Tata and Sail, which gives to panel more strength. We adopt seven-tank process to prevent all types of corrosion and to get best powder coating finish. 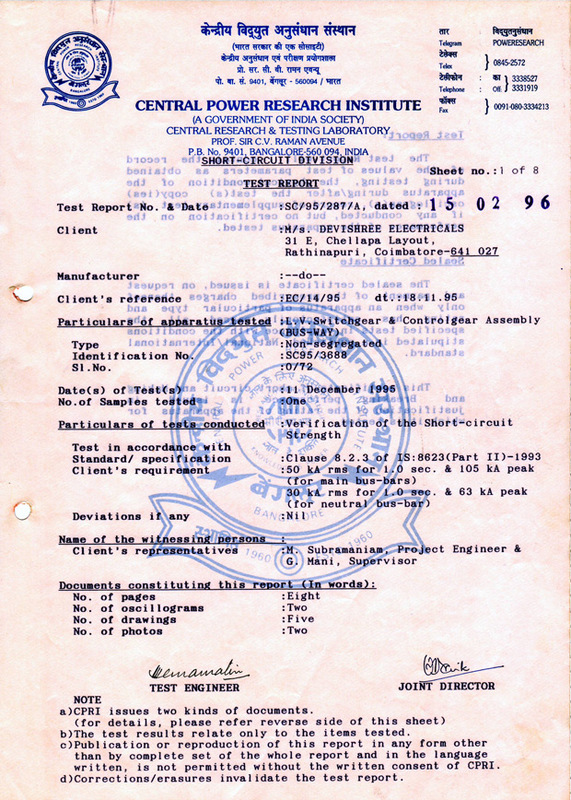 Our boards are type tested by CPRI – Bangalore that gives more value and safety to our panels. To ensure the customized design, fabrication, assembly, interconnection arrangements and satisfactory operation, our control and testing engineer will test every manufactured panel at our works. 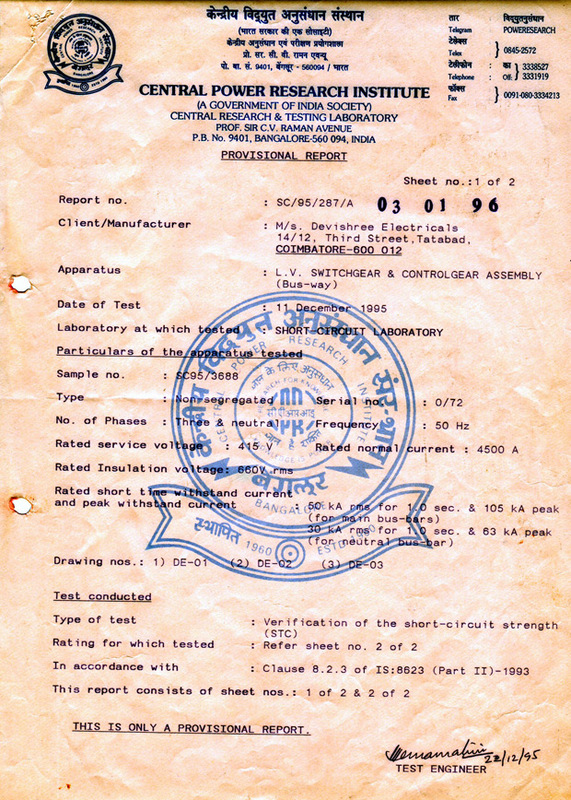 Type test and routine test certificates will be issued for tested panels at the time of delivery. Our boards are always reliable with original components used in all parts, which serve you best for more years without any trouble. 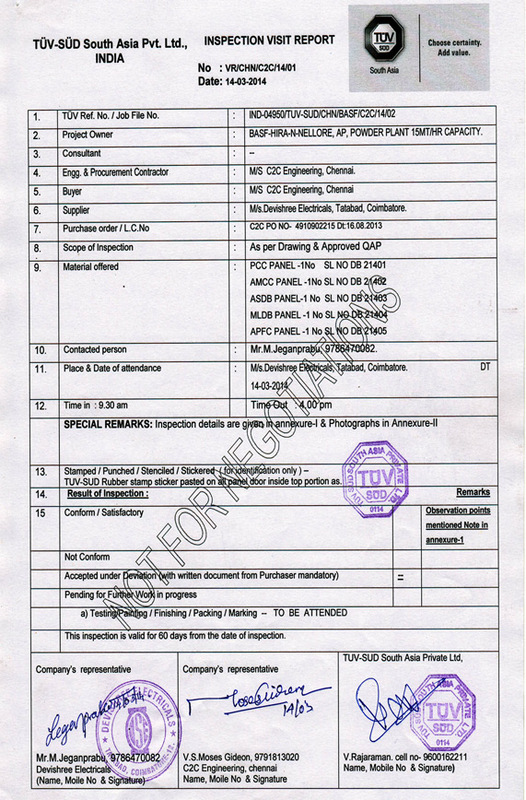 Our panel's were Inspected and tested by TÜV-SÜD South Asia Pvt.Ltd., India for one of our client. © 2013-14 Devishree Electricals. All Rights Reserved.